In recognition of their accomplishments and exceptional scientific contributions, two LASP scientists have been elected as fellows of the American Geophysical Union (AGU). 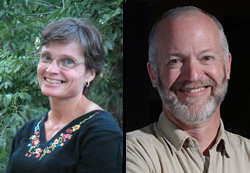 Bruce Jakosky and Cora Randall have been recognized by their peers for their outstanding work in Earth and space sciences with an honor that is bestowed upon no more than 0.1% of the AGU membership annually. Bruce Jakosky serves as Associate Director for Science at LASP and CU-Boulder professor in the Department of Geological Sciences. He performs research on the geology of planetary surfaces, the evolution of the Martian atmosphere and climate, the potential for life on Mars and elsewhere, and philosophical and societal issues in astrobiology. Jakosky is Principal Investigator for the 2013 Mars Atmosphere and Volatile Evolution (MAVEN) mission, which is the first mission devoted to understanding the upper atmosphere of Mars. Cora Randall is a professor in the department of Atmospheric and Oceanic Sciences at CU-Boulder and teaches courses in chemistry, climate, and remote sensing. She investigates processes related to stratospheric ozone depletion, polar mesospheric clouds, and atmospheric coupling through solar and magnetospheric energetic particle precipitation. Randall is Principal Investigator for the Cloud Imaging and Particle Size (CIPS) experiment on the NASA Aeronomy of Ice in the Mesosphere (AIM) satellite mission, which is studying long-term changes in ice crystal clouds in the mesosphere and their relationship to global climate change. Established in 1962, the AGU Fellows program recognizes nominated members who have attained acknowledged eminence in the fields of Earth and space sciences as valued by their peers and vetted by a committee of Fellows. Primary criteria for evaluation in scientific eminence are major breakthroughs, discoveries, and paradigm shifts. The Fellows program serves to meet the need of identifying authorities who can advise various government agencies and other organizations outside the Earth and space sciences.